Sea ice on the top of the world melts to second lowest on record. The September sun is low on the horizon and polar night is fast approaching. Arctic sea ice appears to have reached its 2016 minimum on September 10th, according to National Snow & Ice Data Centre that follows satellite images from the high north. Lots of sea ice melted in early September. The ice cover stood at 4.14 million square kilometres on September 10th, the second lowest extent on record. Only 2007 had less sea ice by the end of the season than this year. More worrying, the thickness of existing ice and cracks in it, tells us that next summer could see an extent lower than anytime earlier predicted. The waters in the circumpolar north have never in modern history been warmer than now. 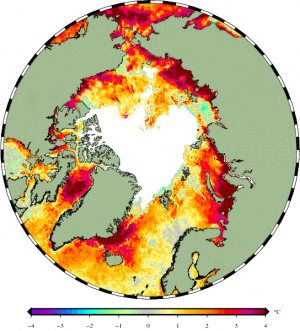 “All Arctic Oceans that is not covered by ice is now 4 degrees Celsius warmer than normal. That goes for the Kara Sea, Laptev Sea, East Siberia Sea, Beaufort Sea, Baffin Bay, Greenland Sea and the Chukchi Sea,” says ice researcher Rasmus Tonboe with Danish Meteorological Institute. He explains that such extreme high temperatures as seen now come because darker sea surface absorbs more heat than with-bluish sea ice. Water surface temperatures on September 8, 2016. Graphics by Jacob Høyer, DMI. “Extent of Arctic sea ice was record low early this year. Larger areas north of Canada and Alaska, north of Norway and Russia and along the north coast of Siberia lost sea ice early in the season, so the water got heated by the sun for a longer period, resulting in the high temperatures we see now,” Rasmus Tonboe tells in an article by the Meteorological Institute. Tonboe believes this will lead to very weak sea ice in 2017. No places on earth have more detectable proofs of climate changes than the Arctic. Record weak sea ice, high water and air temperatures, hungry polar bears and fish stocks on the move. If Santa Claus stayed home at the North Pole last Christmas, it would be like an Arctic summer. Late December had a weather system of low pressure with strong winds thatsent a strong heat wave to the top of the world. Although the sun had been under the horizon for three months, temperatures at the North Pole were 40 degrees Celsius warmer than normal. For a day actually above freezing zero. Svalbard’s Longyearbyen settlement, the northernmost town on the planet, had weird +8,7 degrees Celsius by Christmas. That is comparable to a “warm” summer day so far north. August 2016 turned out to be the warmest August on planet in the 136 years of modern record keeping, NASA reported earlier this week. Average for the planet, the temperature was 0,98 degrees Celsius warmer than the August mean temperature from 1951-1980. NASA has collected data from 6,300 meteorological stations around the globe.